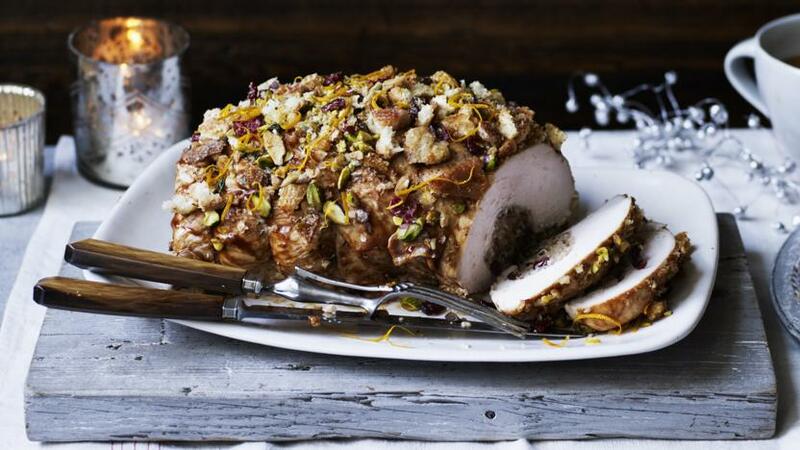 This moist, flavourful Christmas turkey roll with a crunchy topping and a bacon stuffing from Tom Kerridge banishes dry turkey nightmares for a perfect Christmas dinner. For the crumble topping, crush the pork scratchings and the sourdough pieces in a bowl. Add the pistachios, cranberries and thyme. Mix with your hands and set aside in a covered container. For the stuffing, mix together all the ingredients apart from the bacon. Mix to combine. Trim any bits of fat or membrane from the turkey. With a sharp knife, open out the turkey breast as if you are butterflying it. Place the turkey between two sheets of cling film and flatten it out a little with a rolling pin. Cut two large pieces of aluminium foil and lay the turkey breast on top. Season with salt and pepper. Spread a generous dollop the stuffing mix in a 5mm/¼in layer onto the turkey breast and then use the foil to help you roll it up like a Swiss roll. Completely encase the turkey in the two layers of foil and secure with cook's string at regular intervals along the length of the roll. Place in the fridge until needed. Preheat the oven to 120C/250F/Gas ½. Add 400ml/14fl oz boiling water to a deep roasting tin. Place a wire rack in the tin and place the rolled turkey breast on top. Cover the roasting tin with aluminium foil. Roast in the oven for 1½-2 hours, then check the core temperature with a meat thermometer. You are looking for a temperature of 70C/160F. If it is not ready, place back into the oven and continue to cook until it reaches 70C/160F. Once cooked, remove from the oven, cover with aluminium foil and set aside to rest for 40 minutes. When cool enough to handle, remove the string and foil. For the stuffing, preheat the oven to 170C/325F/Gas 3 and line a terrine mould or flameproof bowl with the streaky bacon, leaving some excess hanging over the sides. Pack the mould with the remaining stuffing mix and wrap the bacon over the top. Bake in the oven for 45 minutes, or until the middle has reached 70C/160F on a meat thermometer. When cooked, remove from the oven and set aside to rest for 20 minutes. After 20 minutes, turn out the stuffing and pat dry. Heat the grill to hot, then grill the stuffing until the bacon is crisp. When rested, remove the turkey from the roasting tin and brush a thick layer of brown sauce over the top. Cover with the Christmas crumble mix, top with a little orange zest and serve straight away with the stuffing.